“If the caps fits…”. From hats to helmets in Autumn 1915. 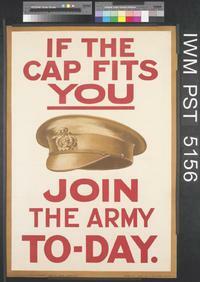 ‘If the Cap Fits You‘ appeared as the text of a poster issued by the Parliamentary Recruiting Committee in 1915. Like many advertisements both then and now, it played with a carefully calibrated set of meanings. On one level, the familiar idiom of ‘if the cap fits, wear it’ raises questions of identity and individual affirmation. On another, this idiom was targeted via a specific type of cap and the diction of direct address. As the image confirms, the metaphorical ‘cap’ is now to be seen in terms of the khaki service cap, while the obligation to ‘wear it’ is re-interpreted via the action of ‘joining- up’, and the identity politics of active service. In terms of language, this can, in fact, raise other interesting issues. In 1914-15, the cap, as here, formed the prototypical image of the British soldier, functioning not only as an item of uniform but able to emblematise wider issues of national and ideological identity. Helmets, in contrast, operated in a similar way for the enemy. While helmet in the sense ‘a defensive cover for the head’, which is either made with, or strengthened with, metal, had long existed in English, usage from early in the war confirms a careful divide in this respect, As in the extract below (taken from the Scotsman in September 1914), helmet operates as a form of semantic shorthand or ethnonym (‘a proper name by which a people or ethnic group is known’). In what becomes a pervasive pattern of writing the enemy, helmet connotes not merely an item of clothing, but the enemy per se. German troops have apparently been interspersed with the Austrian soldiers in the entrenchments for the purpose of raising the moral of the latter. What this moral is worth is apparent from a report received from a correspondent on the frontier, stating that after the Russian attacks on the “bluecloaks” – namely, the Austrians – took to flight, while the “helmets” i.e., the Prussians, were prepared to die to the last man, and perished accordingly. The German helmet, referring to the spiked leather and metal pickelhaube was to be a distinct, and distinctive, marker. In other words, To appropriate the diction of the recruiting poster, in this light, If the cap fits, one is British. if the helmet fits, one is not. A woolly bear ? Explosion over a trench. Bibliothèque nationale de France @Public Domain marked. The ingenuity of the British soldier in inventing picturesque names for the various engines of destruction brought to bear against him is well known, and with the development of new weapons the number of nicknames in use has been extended until they form a language which is most bewildering to a stranger. The article was headed ‘Tommy’s Slanguage’ in ways which drew attention to the lexical creativity which already seemed particularly in evidence on the Western Front. Slanguage, a blend or portmanteau of slang and language, was — perhaps predictably — another form which drew Clark’s own attention, not least since, as he quickly established, it represented yet another absence in the relevant section of the OED (which had been published three years earlier, in September 1911). Slanguage was thus doubly valuable for the Words in War-Time project – as a word about words it had an obvious thematic pertinence. 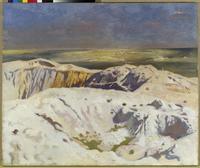 Moreover, as in Clark’s early emphasis on the kind of word-pictures which would be vital in reporting and recording war, slanguage was described in terms which drew attention to the visual and picturesque quality of the coinages which had, within the first months of war, already come into being. War, as many writers have explored, is a profoundly alienating experience, wrenching those who participate in it – whether voluntarily or otherwise – away from their familiar paths and patterns of life. Language, as the Words in Wartime project confirms, was, in many ways, to be part of this same process. A diverse range of words acquired new meanings and senses, or were forced into new combinatory forms and creative combinations; others faced sudden obsolescence or an equally unexpected rise to public prominence. Language could, however, also be used to familiarize the entirely unfamiliar, offering an at times bizarre domestication of the alien world of life at the Front. It was by processes of this kind that, as in Edmund Blunden’s later poem ‘Trench Nomenclature’, the shells which rained down on the battlefield could be depicted in terms of the firework displays of peace-time: “Thence Brock’s Benefit commanded endless fireworks by two nations,// Yet some voices there were raised against the rival coruscations”. Brock’s fireworks had, since 1865 provided free public displays (‘benefits’) which were held once a year at Crystal Palace in London. 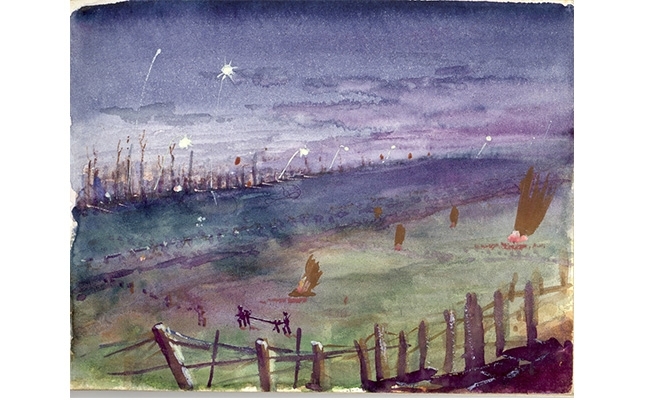 Transferred to the battlefield, such forms – as earlier news reports attest – could draw attention to the paradoxical beauty which war could offer, here by means of the colours and brilliance of the bursting shells set against the dark skies of the Western Front. Nevertheless, the irony of such transferred meanings was also plain; the public displays which took place over the battlefields of WWI were staged with a rather different intent, while the benefits which might be conferred were, with typical trench humour, highly dubious. As the 1972 Supplement to the Oxford English Dictionary confirms, the diction of Brocks benefits became a staple aspect of war narratives. Evidence in the dictionary is traced back to 1920, first being attested in Phillip Gibbs’s Realities of War: ‘They…opened such a Brock’s benefit that the enemy must have been shocked with surprise’, as well as in, say, as Ian Hay’s Willing Horse (1921): ‘The Germans were furnished with bombs which exploded on impact; ours were of the Brock’s Benefit type, and had to be lit with a match’. The legacy of such diction continues across the twentieth century: as Robert Burchfield noted in his 1972 definition in the Supplement, the sense was that of ‘a brilliant illumination at night, esp. in war, from searchlights, flares, artillery, etc.’. ‘Captain Berners, of the Irish, who was at the depot, was the life and soul of our lot. When shells were bursting over our heads he would buck us up with his humour about Brock’s displays at the Palace’ (Star 22 September 1914). While this differs from the collocation which would, in time, later be habitualized, the direct speech which the Star reports contains its salient elements; the ‘Palace’ is ‘Crystal Palace’, and shells are – through the medium of words – transformed, if only temporarily, into Brock’s fireworks which explode without malign intent. As in other aspects of trench slang, humour and the play of words could enforce a sense of solidarity and resistance in which meaning spanned life before the advent of war, as well as the dislocations which conflict would bring.